Movies are back at the Capawock. On stage at the Capawock Theatre last Friday evening, Carly Simon played guitar and sang the lyrics to one of her songs, Back the Way. 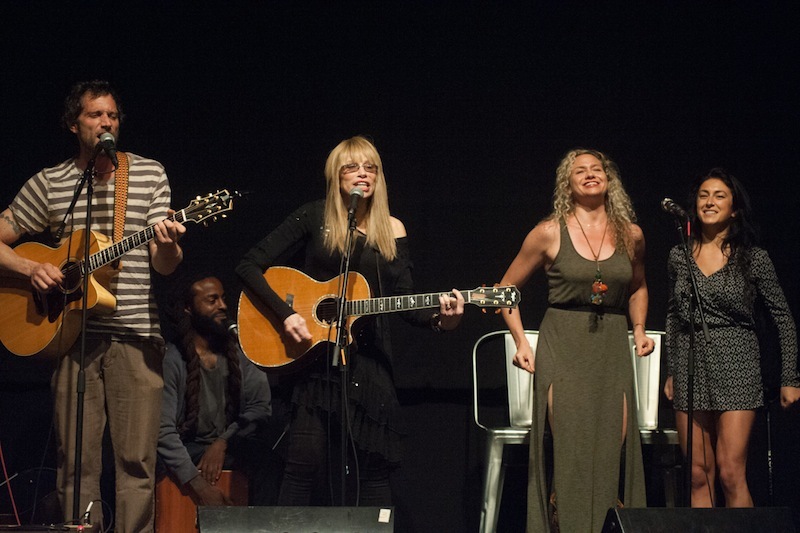 “Back the way it was before, before the door was opened . . .back the way it used to be,” Ms. Simon sang, joined on stage by other musicians including son Ben Taylor and daughter Sally Taylor. It was a fitting way to begin Friday night at the Capawock, which was in many respects back to the way it used to be: a full crowd filling the seats, popcorn popping in the lobby and a film on the big screen. The 102-year-old theatre had been dormant since September 2013; her sister theatre in Oak Bluffs, the Strand, last screened a film in 2011. Both were in disrepair and needed work to catch up to the digital age. This spring, Vineyard businessman Mark Snider mounted a quick and successful campaign to restore the theatres and bring them back to life. 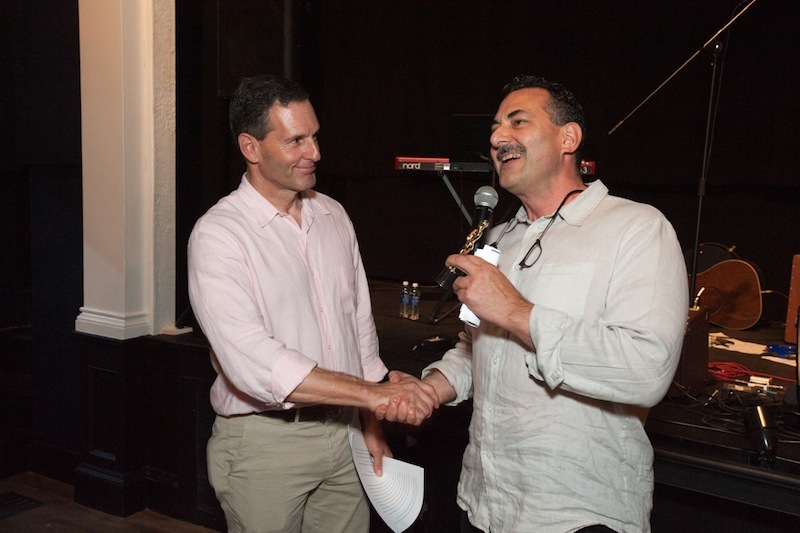 The Martha’s Vineyard Theatre Foundation has raised $820,000 toward a $1 million goal. Friday’s invite-only gala celebrated the newly-renovated Capawock, which officially opens to the public Saturday. The Strand will open June 20. The lobby smelled like popcorn and fresh paint as people trickled into the theatre, greeted at the door by Mr. Snider. The restored movie venue was celebrated first with music. Ms. Simon, a board member for the theatre foundation, took the stage with her children and John Forte, Sophie Hiller and Oli Rockberger. “The first movie I saw here was Muppets Take Manhattan,” Ben Taylor said. Nearly every seat was full in the old theatre made new. The theatre was completely gutted, Mr. Snider told the audience, and retrofitted. Improvements include air conditioning and heat, state of the art digital sound and new bathrooms. Walls are dark blue with and yellow-and-white striped curtains framing lanterns. Murals created by Margot Datz grace the lobby; the artwork depicts seagulls eating popcorn and candy. “Seagulls will eat anything,” one onlooker observed. Ben handed the guitar to his sister, Sally and the group sang the original verse of You’re So Vain before Mr. Snider took the stage. “Never in my wildest dreams did I ever think that Carly Simon and her talented family would be an opening act for me,” he said. “It is a miracle that were here today,” he continued, noting the significant date: 98 years ago, John F. Kennedy was born. He said he hoped that the theatre revivals represent President Kennedy’s spirit of optimism. He thanked the members of the community who helped pull together for the cause, including the Hall family, the owners of the theatres who agreed to lease them to the foundation. The theatre opens to the public Saturday. Ben Hall Sr., said earlier this week that the last movie to show at the Capawock was Woody Allen’s Blue Jasmine — fitting, he said, because of the blue motif inside the theatre. Friday’s inaugural film was Pitch Perfect 2, the new musical comedy that continued the musical theme of the night, Mr. Paradise said. Before the main feature began, the audience saw a short clip of Vineyard history created by the Vineyard Gazette and Martha’s Vineyard Museum, one of several short films that will screen before the movies. Earlier in the night, Dave Smith admired the small blue lights lining the aisle and anticipated the quality of the sound from his seat toward the back of the theatre. His company, DASECO, did the sound and electrical work for the theatre, working “unbelievably fast,” he said. When he heard about the theatre project, Mr. Smith said, he offered to help with the electrical part of the renovations. “The whole company jumped in,” he said. Now the Capawock, and soon the Strand, are set up for the next 20 years. “I said, me too,” Mr. Smith said, munching popcorn and waiting for the show to start. This is wonderful! I can't wait to see some rainy day movies when I vacation on the Vineyard this summer! SQuire and I are so excited to attend on Saturday night. Congratulations to Mr. Snider, Mr. Paradise and Mr Hall for making it happen and a BIG thank-you to Carly Simon and her family for investing time, finances and talent to our island. Like Mr. Snider, I also saw ET at the Capawock. Congratulations to all for restoring this important community institution in vineyard Haven. I look forward to being back at the movies this summer. Three cheers and thank you to those who made this happen! I love The Capawock and saw my first adult movie there with my Dad - "South Pacific". It was a special day and I am so glad that others will have the chance to see a special movie in such a classic theater. Three cheers! 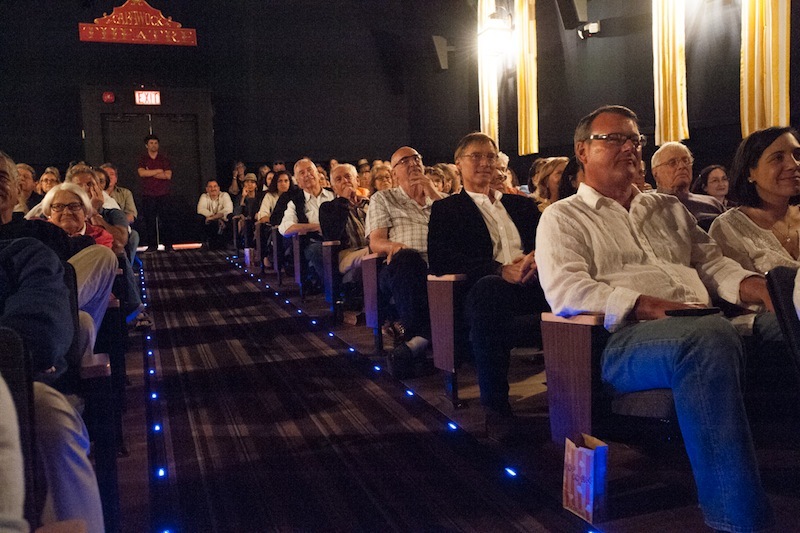 A Tale of Two Theaters tells the story of the renovation of the Capawock and Strand theatres.